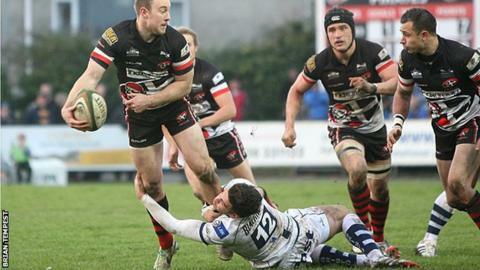 Cornish Pirates coach Ian Davies says the 21-15 win over big-spending Bristol shows his team's growing maturity. Bristol's squad featured former Wales star Nicky Robinson and several ex-Premiership players, but they have now lost twice to the Pirates this year. "We've got a lot of young players and for them this is probably the biggest home game they've played in." Bristol's squad also includes the likes of Argentina international Mariano Sambucetti, former Harlequins and Newcastle winger Charlie Amesbury and ex-Leicester scrum-half James Grindal, and they are coached by former England and Scotland boss Andy Robinson. Davies, who has tipped Bristol to win the Championship, said: "There was a massive crowd and atmosphere and they had to concentrate for the full 87 minutes in the end. "Last week we switched off against Jersey and we couldn't afford to do that this week. We really saw it out. "We performed to a man against Bristol again - and you have to, they're a cracking team. You saw from the first whistle that Bristol came with a lot of intent to play and it was cracking game of rugby." The Pirates threw away a winning position in the final moments against struggling Jersey last week, and Davies said his youthful side had given a superb response. He added: ""I've said all the year that this is a development season and it will be a rollercoaster - and this week we were at the top of the rollercoaster whereas last week we were probably at the bottom. "Now we have to back it up against Nottingham and try to stay at the top of the rollercoaster and not come crashing back down - but we should also bask in the glory of a really good win."